Clayton Thorson surveys the field. 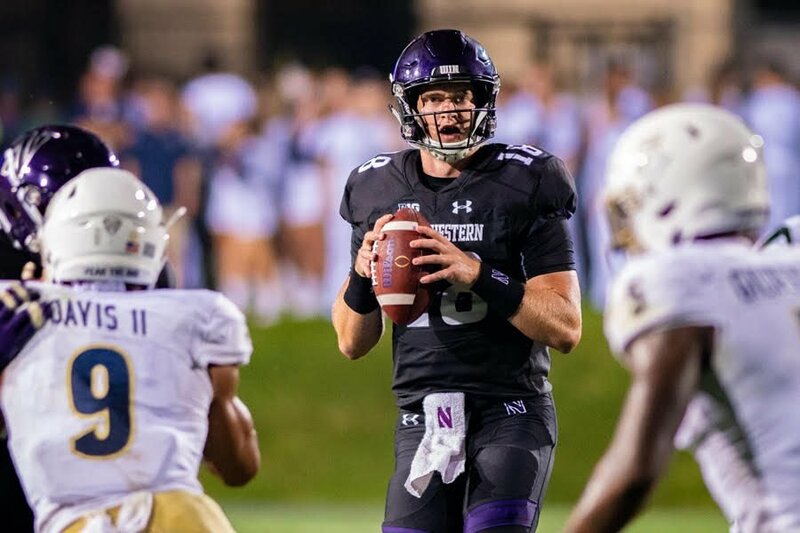 The senior quarterback's three critical turnovers were decisive in Northwestern's loss to Akron. The first time the ball left Clayton Thorson’s right hand and ended in an Akron touchdown, Northwestern realized it was locked in a tight contest. The second time the Zips scored on a play that began with the senior signal-caller marshalling the Wildcats’ offense, it gave the visitors their first lead. And the third time NU’s soon-to-be NFL Draft pick walked off the field with Akron in the end zone, the Cats’ chances of a comeback had been all but extinguished. So it was on a startling, nightmarish Saturday night for Thorson, who threw two interceptions returned for touchdowns and fumbled on another play that ended in a score, as NU (1-2, 1-0 Big Ten) blew a 21-3 halftime lead and lost 39-34 to the Zips (2-0) at Ryan Field. All three Akron defensive scores came within 11 minutes of game time spanning the third and fourth quarters, the latter two on consecutive possessions just 64 seconds apart. The first shock came late in the third quarter, when NU passed up a chance for a 24-13 lead with a field goal conversion. Instead, Thorson fired across his body on fourth-and-three from the 16 yard line, failing to hit senior receiver Flynn Nagel but finding Zips safety Alvin Davis, who tiptoed 97 yards up the Akron sideline into the end zone. The Cats’ next two drives resulted in a touchdown and a missed field goal, but NU again spiraled downhill. The subsequent drive started in promising fashion, as the Cats escaped the shadow of their own goal line and approached the 20-yard line. But on third-and-four, a scrambling Thorson was stripped of the ball, which ricocheted closer to that goal line with each successive bounce. Before long, it had crossed the line, and not long after, Zips linebacker Ulysses Gilbert smothered it. Thorson trudged off the field, and Akron’s sideline erupted in pandemonium. That elation grew just two scrimmage plays later, when the gunslinger couldn’t connect with junior receiver Bennett Skowronek, instead finding Davis once more. Fifty yards down the field, the Zips had a two-possession lead, Thorson had the seventh pick-six of his career and NU was well on its way to a shocking defeat.